This is my very favorite sort of recipe - a non recipe! The Mister loves Italian food. I've become quite "meh" about most pasta, especially pasta with red sauce, which again The Mister loves. He "casually" mentioned that he'd seen a delicious looking chicken parmesan on TV recently. Now I am very lucky that The Mister is a very easygoing eater - he'll eat pretty much anything you put in front of him, is always complementary, and very rarely complains about what I cook. So occasionally I like to cook things he brings up, because he's obviously interested in them. Occasionally. Not too often. Don't want to spoil him or anything. Anyhoo, the chicken. So I preheated my oven to 425' and got 3 shallow bowls ready for the breading of the chicken - flour seasoned with salt and pepper in one, 2 beaten eggs in the second, and panko bread crumbs in the third. I lined a baking sheet with foil, placed a cooling rack on the sheet and sprayed it with non stick spray. Then I cut up 2 chicken breasts into 3 cutlets each. Flour, egg and bread the cutlets and lay on the baking rack. I baked for 15 minutes, flipped, and baked for 5 minutes more. 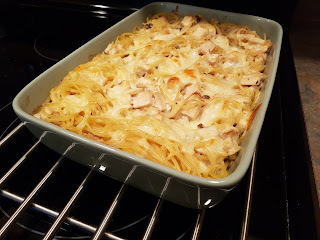 Then I removed the tray from the oven, spread each chicken piece with a few spoons of pasta sauce and topped with shredded cheese. Back in the oven for 4 or 5 more minutes, until the cheese is melted. I was going to sprinkle them with parmesan when they came out of the oven, but forgot.